In 1926, Mervin W. LaRue Sr. moved from Toronto to Chicago with his wife Johanna “Jo” (Wartman) LaRue and son Mervin Jr. to start a job at Bell & Howell, engineering the company’s new 16mm sound film technology. 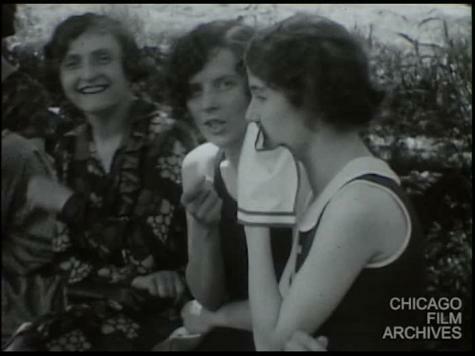 The second couple that appears in the first section of this film is Anna and George Bastier, family friends of the LaRues who had lived together with them in Toronto. Mervin Sr. and George were both photographers and worked as partners for several years, and Jo and Anna were close, due in part to their Germanic lineage at the time of WWI. These home movies capture scenes from the family’s first years in Chicago and include the LaRues and Bastiers horsing around and staging parodies of familiar film genres (including an armed robbery starring Mervin Jr. and a clown car comedy bit). The rest of the film includes Mervin Jr. roller skating and socializing, swimming, and horseback riding with other boys at St. John’s Military Academy summer camp, at age 9.